Five long years ago, when I worked as a professional sorority girl (no, seriously, I was the associate director of finance thankyouverymuch) I was given a gift. Well, it more like a left over from our convention that summer but I tell myself it was a gift. And this gift was a violet. Being the official flower of my organization, I have been given many violets over the years. And I’ve killed them all. As a bumbling college student, I had no idea how to take care of such a delicate plant. It was when DAd recommended watering it from the bottom. 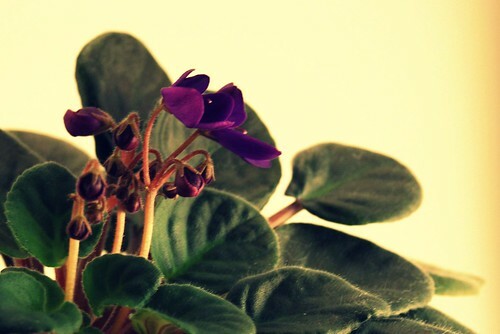 I placed my new gifted violet, still in its plastic terracotta pot, in a styrofoam bowl and watered it from the bottom. Success. My teammate then shared her secret: violet food. And let me say Miracle Grow really does perform miracles. My violet flourished. And flourished it did. I’ve re-potted it twice. I took the time to turn its container so that it would grow gracefully. And then I moved, stuck it on a shelf and it became a monster. This thing got HUGE. No matter how hard I tried to keep it growing straight, this bad dog bent over, sucking sunlight like an emo teen with fake fangs. It couldn’t get enough of it. My beautiful violet had a problem. I overlooked it, was in denial and told myself nothing was wrong. And then it happened. This weekend, my bad dog of a violet was looking a little wimpy. I took her down from the shelf, gave her fresh water and food, and placed her in the window. She needed some R&R and I was making sure she got it. But the leaves didn’t bounce back like I hoped they would. It took a minute or so to realize it but it was confirmed last night: my violet was dying. I thought for sure that I killed it. I’ve been known to slip up and murder violets in the past; never mind this one has been in my possession for five years. I scoured over the plant, lifting the sad little hairy leaves trying to figure out which dagger actually struck the jugular. And then I saw it – the missing link – the one piece of evidence that might suggest this wasn’t murder but rather violet suicide. This blood-hungry, sun-sucking plant was so gluttonous that she broke her own spine. The weight of the leaves tipping over the top of pot slowly made the plant weak and vulnerable. And the thick stem leading to its roots had turned gooey (yes, gooey) and she easily unplugged herself in my hand. She didn’t even put up a fight. So sad. It’s tragic. Leave it to the hubs to point out the obvious while I’m standing their holding the stem of my violet. “Yeah, well it’s definitely dead now.” Thank you, baby. I never would have been able to piece that information together without your high level insight. Could I have prevented this? Probably. A bigger home, a larger pot could have had her saving grace. But hindsight’s 20/20. So instead of playing coulda/woulda/shoulda, I’m moving on. I had a five second funeral service over the trash can and will be holding a moment of silence this afternoon at 2p in the pod. Feel free to join me. You might think it’s too soon, but I will be purchasing a new violet at Kroger this weekend. I need to fill the purple void as quickly as possible. Rest in peace, my hairy little plant. 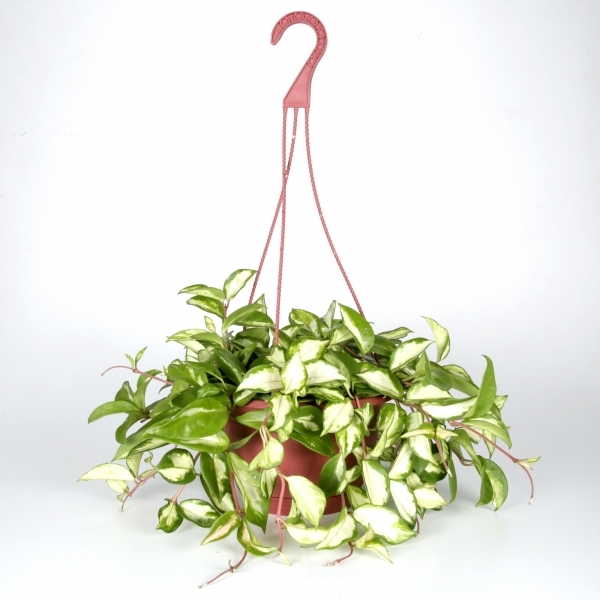 shutterboo - A self-watering pot is best – can find at the depot or lowes. And the miracle grow violet food helps it bloom. Once the leaves touch the pot, they usually die so I pinch them off. This time, I pinched off the whole thing. D-oh. Wendi - Oh Boo, I am a serial plant killer. Next time you’re at the Garden Dept of your choice, don’t be surprised to see my picture on the 10 Most Wanted list. Currently, I’m managing to snuff out my previously trouble free shrub roses. shutterboo - Roses are hard. Knockouts are usually trouble free. A tip I learned though is if you trim a rose bush, put a little elmers glue on the tip to seal it. Keeps insects from burrowing into the plant. Susan the Pod-Mate - I’m sorry I will not be able to attend the memorial service in the pod in person today, but I will bow my head for a moment at 2 this afternoon. RIP, pretty flower. shutterboo - There was nothing to divide. That I could tell. Every time a baby v popped up I pinched it off. Thanks for the offer but I’m gonna pick out a new one. I can’t wait to long – separation anxiety. Debbie - By any chance, was that ZTA?? If so, I, too, am a member and have long loved violets! I had two — a white and a purple — both of which bit the dust last year. I even had them in those self-watering pots that I got at Wally-world, and I fed them African Violet food and everything. Now I’m raising spider plants — sooo much easier and I’ve got my very own little nursery going on. Cool! jasmandii - Am I too late for the Moment of Silence? Oh well 8 min later is not going to make a difference, the silence will be the same. Debbie - Wow, small world — I didn’t realize Sigma Kappa was HQ’d in Indy, too! elizabeth - In honor of your hairy friend who is no longer with you, I will wear purple and not shave my legs tomorrow. omawarisan - My condolences. Sounded like she just couldn’t stop eating. Sad. gitanorumano - I know what you mean about the roses. I have a pot of miniature roses, and one of the two of them is struggling to come back. They are still mad that I left them for a week while I went on vacation. Every thing else seems to be recovering in spite of me. It could help that we have been having rain every afternoon for the past week. My worry at the moment is that everything will get waterlogged, and die from too much water. http://site.unbeatablesale.com/img054/engd019.jpg This is my latest acquisition. It is Hoya, commonly known as a wax plant. They are good for plant killers as they don’t require much attention. The depot generally carries several varieties. thoughtsappear - I am so horrible with plants. I’ve killed so many over the years that I gave up on plants long ago.